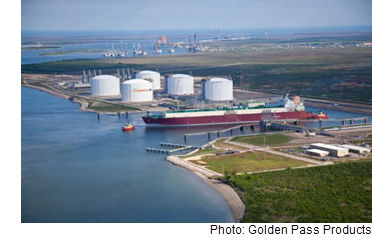 ​​ ​SABINE PASS, PORT ARTHUR – Qatar Petroleum and ExxonMobil are developing the Golden Pass LNG export project. The $10+ billion project will have capacity to produce around 16 million tons of liquefied natural gas per year. It is expected to create about 9,000 jobs over the five-year construction period and more than 200 permanent jobs during operations. Golden Pass is part of ExxonMobil’s plans to invest more than $50 billion over the next five years to build and expand manufacturing facilities in the U.S. Working interests in the Golden Pass LNG export project are 70 percent Qatar Petroleum and 30 percent ExxonMobil.